Two-part corner profiles made of rigid, recycled PVC and soft CPE. 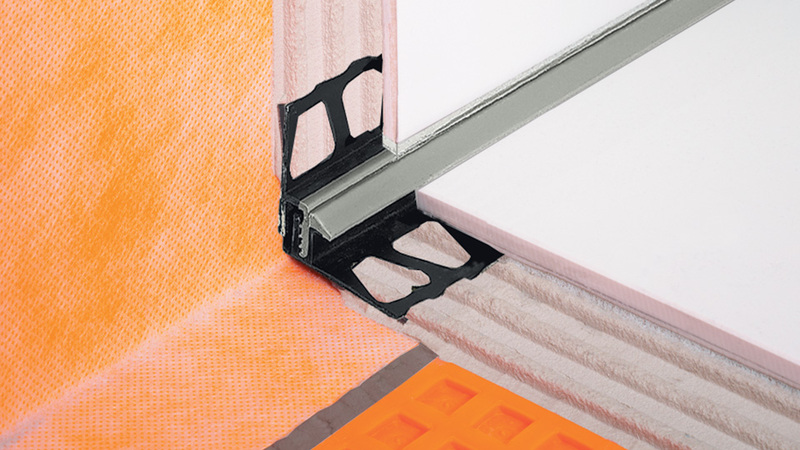 Provide durable, flexible and maintenance-free perimeter joints between walls and floors. Single-part corner profile for interior wall corners, made of rigid, recycled PVC. Can also be used to create flexible wall to floor transitions, in cases where the floor covering is not constructed as a floating screed. Cove-shaped profile made of rigid, recycled PVC, designed for wall to floor joints. Features an integrated joint chamber that makes the profile suitable for areas with stringent hygiene regimes. Cove-shaped profile made of rigid, recycled PVC, designed for internal wall corners and wall to floor joints. Cove-shaped profile made of stainless steel, designed for wall to floor connections. Features a maintenance-free movement zone. Cove-shaped profile made of stainless steel, designed for wall to floor connections. Suitable for areas with stringent hygiene regimes. Cove-shaped profile made of stainless steel, designed for wall to floor connections. Features an inner anchoring leg, making it suitable for use with an extended range of tile thicknesses. Suitable for areas with stringent hygiene regimes. Decorative cove-shaped profile made of aluminium. Decorative cove-shaped profile made of aluminium. Can be connected to existing covering on one side, making it an ideal choice for use in partial surface renovations. Connection joint profile in a choice of aluminium or stainless steel, with replaceable movement zone of soft PVC. Used for creating transitions between coverings and fixed structures such as window frames. Connection joint profile made of PVC. Used for creating transitions between coverings and fixed structures such as window frames. Two-part connection joint profile made of PVC. Used for creating flexible joints to fixtures such as shower trays, baths, door and window frames.